Fiction – paperback; Quercus; 278 pages; 2009. Translated from the French by John Cullen. Philippe Claudel is a French writer, film director and academic. I read his first novel, Grey Souls, in November 2006 and described it as “a deeply mysterious, brooding novel”. 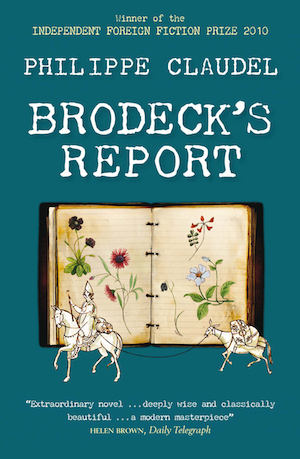 The same could be said of his second novel, Brodeck’s Report, which evokes the same eerie atmosphere. The book is set in a village somewhere in northern France near the German border sometime after the Second World War. Or, that is what we are lead to believe, because Claudel might be heavy on the symbolism and the atmosphere, but he is very light on specifics. We can only assume, from the clues that are dotted throughout the narrative, that this is the case. The story is narrated by Brodeck, a survivor of a (presumably Nazi) concentration camp, who has returned to his village to be with his adopted mother, wife and young daughter. He makes his living by venturing into the nearby mountains to collect data and compile reports on the natural environment for the Government. But one day he is asked to compile a report of a very different kind. A stranger to the village, dubbed the Anderer (which means “the other”), has been murdered by the locals. The locals now want Brodeck, who was not present when the crime was committed, to “explain what went on from the time he arrived in the village and why they had no choice but to kill him”. What results is a rather beautiful, occasionally murky but always symbolic, multi-layered narrative which puts the Anderer’s arrival into context and shows how Brodeck, who is kind-hearted, emotionally damaged and psychologically scarred, begins to identify with him. It meanders back and forth, “leaping over time like a hurdle, getting lost on digressions and maybe even, without wishing to, concealing what is essential”. The Anderer was a mystery. Nobody knew who he was. Nobody knew where he came from or why he was here. And nobody knew whether he understood them when they spoke in dialect. Brodeck, also an outsider (and most likely a Jew, with “a tiny piece of flesh missing from between my thighs”), is the only one who welcomes his arrival because it was a “sign of rebirth, a return to life”. For me, it was as though an iron door that for years had sealed the entrance to a cave had now been opened wide, and the air of the cave had suddenly taken in the wind and the beams of a bright sun. But I could not imagine that sometimes the sun grows bothersome, that its beams, which light up the world, inadvertently illuminate what people are trying to hide. I could quote hundreds of passages from this novel which show Claudel’s uncanny ability to hint at things without nailing them down. Motifs and symbols abound. And the ambiguity in the storyline only adds to the mystery and profoundness of it. This is not an easy book to read, because it is so jam-packed with ideas and abstractions, tangents and digressions, but it is profoundly affecting. It’s a novel about love, alienation, memory, forgiveness, betrayal, how the past informs the future, and the terrible, terrible things of which every single human being is capable. Liked it OK, and as you said: it’s not an easy read. At the first couple of pages, I wasn’t too thrilled at Brodeck’s writing style with an overload of metaphors, but it got a lot better as the book progressed. It reads very much like a dark fable, and quite a lot of animals to boot! I did read the comments over at DGReader; I haven’t got much to add, but the discussion brings out a lot of thinking … and this rather complicated story deserves a bit of analysis and after-thought. It’s very fable-like… particularly with all the animal references — foxes, wolves, donkeys, horses etc. Oh, and those evil, evil pigs! I think is one of those books you need to read more than once to understand/pick up on all the references/symbols etc. I’m reading the second NTTVBG read right now… so you’ll have to stay tuned for the discussion this coming Sunday and my review the following Sunday. I just realised I didnt comment on this, thats a poor sign of solidarity, sorry Kim. I am frnakly going to pot, blogging a day late, not commenting on my fellow NTTVBG hosts posts tut tut. Anyways a wonderful review of what I agree was a wonderful book that I think would have been talked about for another day or so after we had all finished. Its made me rethink what I might choose for Riverside Readers material in the future. I am looking forward to your choice for that too. I’ve got a list of about six possibles for Riverside Readers! I’ll probably end up just choosing one at the very last minute and then regretting that I didn’t pick something else! I heard Philippe Claudel speak about this at last year’s Edinburgh Book Festival. I took lots of notes but have since mislaid the notebook! By no means an unusual event – it’s why I started my blog in the first place! I decided then that it wasn’t for me – there’s only so much holocaust I can take – but the NTTVBG has convinced me otherwise. So please put my name in the proverbial hat. Now to recommend a good book group read. Something different, with lots to discuss. Try Jonathan Falla’s “Poor Mercy” – we had a good time discussing it in January.